With just a few ingredients you can make an amazing platter, such as this one. Not only is it beautiful, but refreshing as well. This dish features all organic fruits and cheese. What a wonderful dish to bring to a springtime brunch or any occasion that you see as fit. I love to have this on a lazy Sunday afternoon, while sitting outside listening to the birds and the wind whistling through the trees. What a peaceful and refreshing way to enjoy your afternoon! Serve as an appetizer, snack or dessert. Cut baguette in thin slices and place on a cookie sheet. Bake in a preheated oven at 375ª on lower rack for 7-10 minutes or until golden brown. Arrange all ingredients on a serving platter. 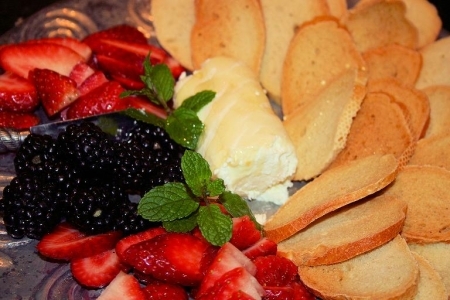 Drizzle honey over the goat cheese, garnish with mint and let your guests enjoy a berry delight! Try Brancott Vineyards Marlborough Sauvignon Blanc (New Zealand),Vin du Lac of Chelan Viognier (Columbia Valley), Chateau St. Michelle Sauvignon Blanc (Columbia Valley), J Cuvée 20 Sparkling Brut Wine (California) or Veuve du Vernay Brut Rosé Sparkling Wine (France).